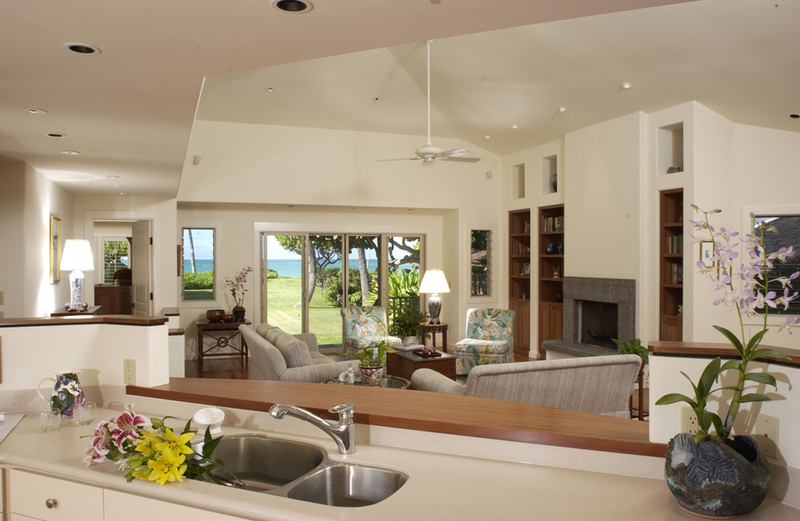 Style at the Beach — Geoffrey Lewis Architect, Inc. 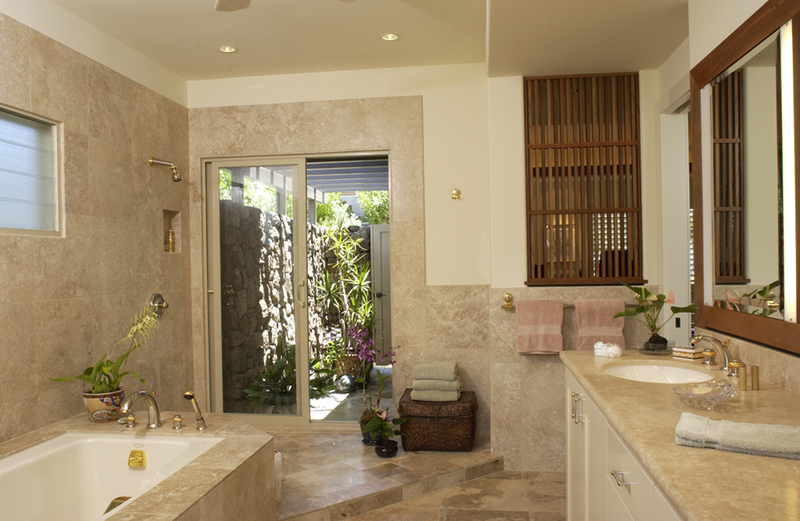 The goal of this project was to capture the wonderful qualities of a ‘beach house’ home situated on laid back Kailua beach. 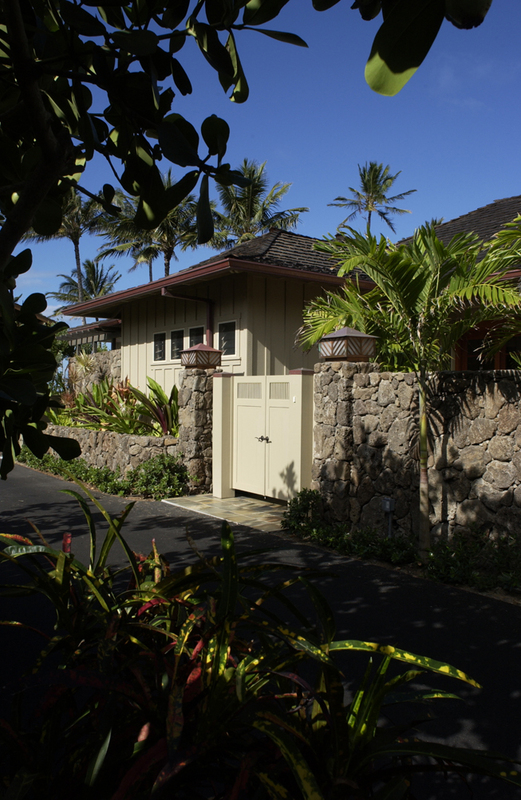 With such iconic elements as the board & batten siding, a ‘Dickey’ double pitched sweeping roof, moss rock walls, a covered porch and local planting palette, this home greatly associates itself as a Hawaiian style ‘beach house. The sandy beige color palette coupled with the turquoise patina (soon to be turning) on the copper gutters and flashings greatly reflect the beach and ocean beyond. 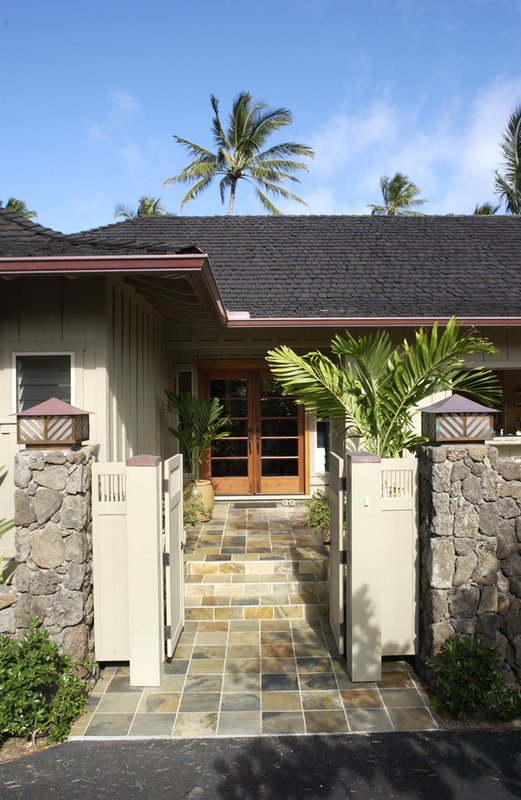 The indoor/ outdoor relationships with the ocean front covered lanai and the side yard outdoor patio also reflect the casual nature one would expect from a Kailua beachfront home. The plan parti (organization) of the home is quite simple. The large great room with the kitchen, living and dining room are working in coexistence, each with a sense of their own space yet speaking to the greater public gathering space. A beach house is not a formal home, but one that expresses the casual nature of island living and relaxed social gathering. The master suite is situated towards the beach front side of the property enjoying the vistas of the ocean beyond and the privacy from the public spaces of the great room. Due to the steepness that the ‘Dickey’ roof affords, a scissors truss was introduced for the great room creating an excellent radiant barrier and the cost effectiveness of a truss roof. The flat ‘attic’ trusses over the kitchen and guest rooms provide for a huge storage attic that is fully habitable for human use with ease. The large storage capacity of the attic relieves the need for excessive storage on the ground floor, providing for a smaller footprint with larger outdoor living spaces and yards.